Footware: the trail is relatively smooth all the way. Comfortable running shoes or trainers are recommended. Hiking boots are not necessary. Urban footwear with smooth soles and/or big heels are not recommended. Clothing: the mountain weather, especially in the autumn, can change rapidly and be cold and wet. Be sure to bring extra layers if it is cold up at Lake Agnes. Be sure to bring a rain jacket, sweater or fleece, hat and mitts/gloves if you are hiking in June or September. From the public parking lot, find the lakeshore trail near the Chateau, and walk along the paved promenade for approximately 200m (Lk. Louise on your left, Chateau on your right). The main paved trail, heading all the way around the lake, goes to a different tea house (Plain of Six Glaciers) - DO NOT TAKE THIS TRAIL! The Lake Agnes trail is the short paved trail heading up the hill towards the forest. Take THIS trail to Lake Agnes. Keep on the trail… keep going uphill! After another while you will come to a horse gate and a new trail junction. Make sure you turn left/uphill after the gate; shortly thereafter you will reach Mirror Lake. 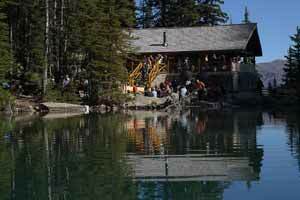 Once at Mirror Lake you are only 15-20 minutes away from Lake Agnes. From Mirror Lake, if you look up, you can see the Tea House just to the right of the rock face known as the "Big Beehive". From Mirror Lake, take the trail to the right and follow it straight to the Tea House. The stairs are the last challenge! The hike to the tea house should take you an hour to an hour and a half, depending on your fitness level and the weight of your pack.